We hear a lot about the way smartphones are making our lives easier and with information and communication simply with the opening of an app. Indeed, we listen a bit more closely whenever we hear someone say, There’s an App for That. Things are no different when it comes to Selling or Buying our home. Some amazing apps have been developed and this blog is written to introduce you to a few favorites Real Estate apps. And at the end of this article I’ll introduce you to my personal app and how easy this can open access to real estate information right around you, wherever you are in Orange County. You can take it with you and easily share with others. The HOME by FannieMae app opens valuable resources to prepare your finances, figure out what you can afford, learn about the home buying process, a planning strategy for home maintenance and even a tool to calculate potential savings on future home mortgage payments. The app comes with a convenient dashboard to keep track of your progress through the process complete with instructive videos. Available for both Apple and Android phones, this app features unique technology that instantly opens information on any home you snap a picture of from your smartphone. You can learn how much it is worth, when it last sold and the selling price. You’ll see information about the number of bedrooms, bathrooms and garage spaces. You can see the lot size and the school district. The app gives access to information about more than 90 million homes across the United States. For homes currently on the market, you may even have access to interior photos. Using HomeSnap helps you narrow down your home search of preferred homes before heading contacting an agent to arrange preview appointments. This can save you lots of time and will definitely help you work more efficiently to communicate with your agent to focus on the homes that fit your needs and minimize viewing homes that just don’t match. The HouseHunter app allows you to keep track of your entire search for your dream home. It stores information, notes and pictures for every home you look at and even allows a rating system so you can evaluate and compare each home you preview before deciding on submitting an offer. Score each home based on requirements you specify with House Hunter’s proprietary scorecard system. View images of multiple homes at once to help you remember which house is which. This can be a valuable tool to help family discussions and to avoid confusing or forgetting important information on each home on your ‘short list’ of best choices. Not just for real estate, the AroundMe app shows you what you can find in any area. So, if your find the home of your dreams, you can see nearby hot spots, where to find the dry cleaners, restaurants and hospitals. It can connect you with points of interest and a plethora of other nearby information so that you can learn about a potential neighborhood quickly without having to do exhaustive searches. Every industry has its own language and LD Real Estate Dictionary is the app that can help you. From “points” to “policy” this app has more than 2000 common real estate terms and their definitions in common English. Navigate the massive paperwork with ease and understanding with this app. As a Berkshire Hathaway HomeServices Team Member, I have a robust app for personal contacts and follow up. 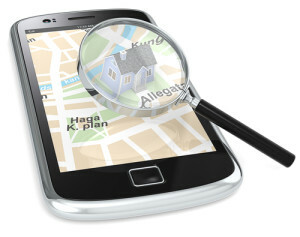 This app offers three powerful features: Firstly, you can open details on active homes listed for sale around your current location (wherever you are; your smartphone location setting needs to be on); Secondly, you can set a search criteria and area and pull up all homes that fit your description; Thirdly, if you see any home with a for sale sign, simply point your phone (with app open) at the home and the app will open all the details of the home. When you’ve located a home that interests, simply contact me and I’ll make the appointment to see the home together. You can receive the app simply by sending a text message “BillStehr” to 949-579-9500 and you will receive an automatic link to receive the app. Check it out. My offer for you and friends. That’s my offering for, There’s an App for That. I hope these offerings will be as helpful to you as they are in my work in Real Estate. If you have any questions or suggestions of your favorite apps — I’m always interested to grow and share.